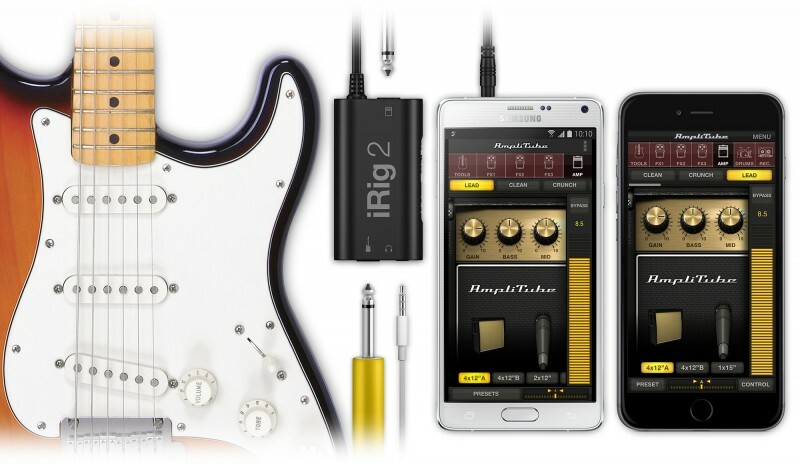 IK Multimedia on Wednesday announced that its iRig 2 mobile guitar interface is now shipping for iPhone, iPad, iPod touch, Mac and Android devices. iRig 2 has several new features over its predecessor, including gain control, a 1/4" amplifier output, FX/THRU switch, compatibility with the complete line of new Samsung Professional Audio devices and support for devices running Android Lollipop. "5 years after, and with over one million units sold, IK is now introducing iRig 2. A significant upgrade, it improves on its predecessor by providing better sound quality and more universal compatibility than ever before - and it does this while maintaining the convenience and ease-of-use that have made it such a staple piece of equipment in the arsenal of millions of musicians around the world." iRig 2 is available at select music and consumer electronics retailers worldwide, and on the IK Multimedia online store, for the same $39.99 price as the original version. The guitar interface is ready to be used right out of the box and comes with a cross-platform suite of apps and software including free versions of AmpliTube for iOS, Mac and Android Samsung Pro Audio. A clip and velcro strap are also in the box. I have the original one and it's pretty junky. I'm not some sort of tone guru expecting ultimate quality, but it wasn't even good enough just to noodle around with. Someone correct me if I'm wrong but the microphone input on the iPhone has a band pass filter on it for voice. Makes your guitar sound... different. Anything past medium gain just sounds like garbage. This thing is still running off the microphone and it's not powered which means to me the "gain control" is actually just a resistive attenuater. If you really want to run your guitar into an iProduct, spring for the extra $$ to buy one that plugs into the Lightning port which he an actual adc converter in it (real gain control, full range audio capture). Get yourself an Apogee JAM. Much better value than this. Or the iRig HD - uses the lightning (or USB, or 30 pin) connector instead of the headphone Jack, sound quality is much better and it's not too much more expensive than the standard iRig. I've thought about picking one of these up to play around with. The new model looks like to have some good tweaks. Anyone have experience using this? Pros/Cons? I use mine often. The easiest way to demo a track for my purposes. Works with garage band very well. No amp required so I can jam away late at night without bothering the cats. If you are using your phone as your amp and effects bay, it is 'good enough' to noodle around with. You will not win awards with it, but it is better than just jamming with an unplugged electric. I really like the iRig 2 - it handles all of the limiting sound issues I had with the original. Does it sound as good as my iRig HD? No - but there is also a significant price difference. For noodling around - using it with an iLoud and my phone, for example - it is quite decent. I gave one of these iRig for Guitar and Bass to my spouse for Xmas and it was inexpensive. For what it does it is remarkable. She hooked it up to her iPad and was pleased with it. If you want superior tone go buy a new practice amp by Blackstar or a small Fender Champ or Marshall amp with tubes. The warmth from tubes is what most tone chasing guitar players want 9 times out of 10.